This is the tenth post in my series on Boston’s Bronze Menagerie. Monday is Patriot’s Day in Massachusetts—the holiday when we celebrate the start of the Revolutionary War. 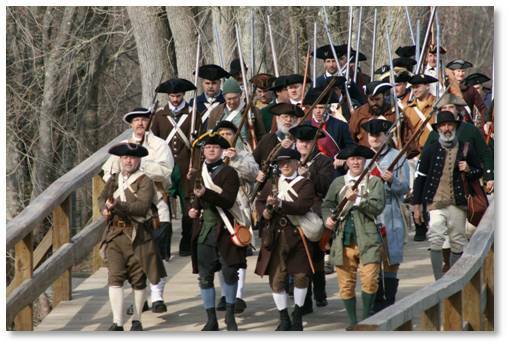 On April 19, 1775, Companies of Minute and Militia from communities all around Concord armed themselves and marched toward Lexington Battle Green and Concord Bridge to engage the British Regulars. 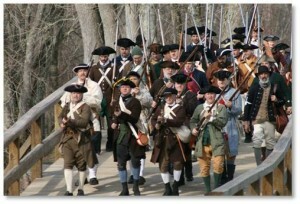 Every year on April 19, Companies of Minute and Militia still march along the Battle Roads and re-enact the two momentous engagements in which the first shots of the war were fired. Also on April 19, thousands of people run far faster and much longer in another annual Patriot’s Day ritual: the Boston Marathon. After sprinting, running, or jogging — whatever pace they can manage — for 26.2 miles, they end at the finish line by the Boston Public Library on Boylston Street. On the next block is Copley Square and that’s where you’ll find the bronze statues that memorialize the people who run marathon.Here are two animals that completed a different race at their own pace. 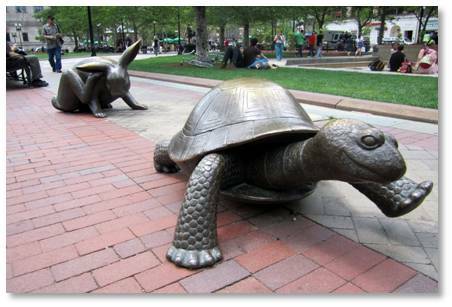 The Tortoise and the Hare are large bronze critters that were created by local sculptor Nancy Schön. A runner herself, she wanted to create a statue to honor those who run the marathon but knew it was impossible to create an image of one human who could encompass the two genders and myriad nationalities who set off from Hopkinton, MA, headed to Boston every April 19. Instead, she looked to create “a meaningful metaphor for the race.” She also wanted a sculpture that would be kid-friendly. Ms Schön settled on Aesop’s fable of the tortoise who plugs away and his opponent, the over-confident hare, to represent all the myriad men and women who run and power wheelchairs along the route every spring. After all, the elite runners sprint across the finish line while the majority race simply to reach it. Some run for charity, some for the personal challenge and some for the fun—and the accomplishment—of it. Others crawl across hours after the crowds have gone home. There are many ways to win a race that don’t mean crossing the finish line first. The sculpture was her idea but the Friends of Copley Square sponsored it to bring a “human factor” to the area and to provide something that’s fun for the neighborhood’s children. The two animals were cast in Boston’s Chelsea neighborhood and installed in May of 1995. The Tortoise and the Hare were dedicated in 1996 on the 100th anniversary of the Boston Marathon. This year is the 120th running of the race. The Tortoise, still plugging away, is ahead and happy about it while the overconfident Hare has finally woken from his nap but stopped along the way to scratch his ear. The animals are much larger than life size and practically invite children to climb on them—which they do frequently. I have never run a marathon. I used to run when I was in high school before running was cool, especially for girls. I could sprint and anchored the relay but I had no real talent for distance. No matter how often I ran, I never got past the same point and that wasn’t very far. My feet seemed to want to stick to the ground. Later, I lost interest in running and training for a marathon when you’re a working mom is tough. Besides, I always remembered that Phidippides, who ran the first marathon, reached Athens, shouted, “Victory. !” and died. He’d already run 280 miles and fought all morning in heavy armor, though. 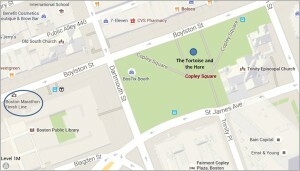 The next time you’re in Copley Square, make sure you hunt up the Tortoise and the Hare and give them a pat. 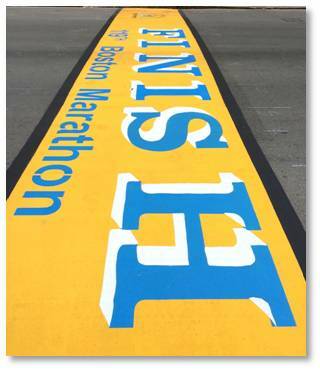 Then walk west on Boylston Street to the finish line, which is brightly painted in blue and yellow all year round. They statues remind us — and the children who climb on them — that flash and speed are not always what they’re cracked up to be. Sometimes you have to just keep plugging, endure the difficulties, and refuse to give in. That’s winning, too, just of a different kind. 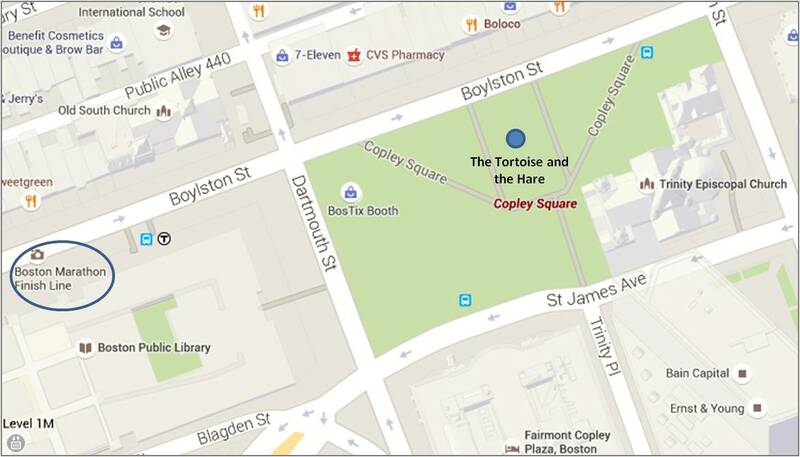 The Tortoise and the Hare are on the Boylston Street side of Copley Square in front of the fountain. You really can’t miss them. I recommend visiting on a day other than Patriot’s Day when the crowds are much smaller. You can take the MBTA’s Green Line to the Copley station or park in the Prudential Center garage and walk up Boylston Street. If you’re going to be in the neighborhood, I recommend signing up for Boston By Foot’s Back Bay tour. It’s a great way to learn more about a neighborhood that went from mudflats to millionaires. This entry was posted in Art and Museums, Boston, Boston By Foot, History and tagged Aesop's Fable, Back Bay, Back Bay tour, Boston by Foot, Boston Marathon, Dave Fowler, Finish Line, Friends of Copley Square, Nancy Schon, Prudential Center, The Tortoise and the Hare by Aline Kaplan. Bookmark the permalink. Most of the details are right but the order of events is wrong: The “First Battle of Lexington” happened in the early morning after the famous rides by Paul Revere and William Dawes. Both riders arrived before 2 AM at the Lexington parsonage of Rev. Jonas Clarke where Sam Adams and John Hancock were staying. The local Militia about 140 under Capt. John Parker then mustered on the Town Common [aka the Battle Green] to await the British reconnaissance force under Major John Pitcairn and advance guard of the 700 men under the command of Col. Francis Smith. When nothing happened after more than an hour, Parker dismissed the men, and many left to go home — the rest settled down in Buckman Tavern. In the meantime Revere and Dawes continued through Lexington and Lincoln toward Concord. However, neither Revere nor Dawes made it to Concord — the alarm that the “Regulars are About” was carried to Concord by Dr. Samuel Prescott who was on his way home to Concord from his girlfriend’s house in Lincoln, when he was recruited by Revere and Dawes. British pickets stopped all three in Lincoln at the “Revere Capture Site,” but Prescott escaped and carried the message to Wright’s Tavern in Concord. Finally at 5 AM Pitcairn and the advance guard of British troops arrived. Pitcairn ordered the 77 Lexington’s Militia who mustered from Buckman Tavern onto the “Battle Green” to disperse. Parker told his men “Stand your ground; don’t fire unless fired upon, but if they mean to have a war, let it begin here.” Someone fired a shot – the first “Shot heard around the world.” A wild melee ensured, and when the cloud of musket smoke cleared and Smith finally arrived to order a halt to the fighting, the first Battle of Lexington had ended — eight Patriots lay dead, and 10 others were wounded. One British soldier was fatally injured. The British now under direct command of Col. Smith then continued their march to Concord to capture the Patriot Supplies — meanwhile Smith sent word back to General Gage in Boston about what had happened on Lexington Common. After a few more skirmishes in Concord at Meriam’s Corner, Smith began a general retreat back to Boston. At the Bloody Angle and Fisk Hill, just before the retreating “Redcoats” reached Lexington Common — Parker’s men had their revenge and the 2nd Battle of Lexington [aka Parker’s Revenge] ensued. For a while the British orderly retreat turned into a rout. Then, just on the other side of the Town Center near Munroe Tavern the 1000 man Relief Column under Col [acting Brig. Gen.] Hugh, earl Percy arrived complete with cannon. After a few cannon shots and a pause to reorganize, replenish and rest, the retreat resumed — coming under fire for the remainder of the trek back to Charlestown. Finally some 21 hours after leaving Boston, the exhausted and “defeated” British troops reached the protection of the guns of HMS Somerset. The final toll of the Battles of Lexington and Concord and the retreat to Boston: 73 Redcoat soldiers killed, 174 wounded, 26 missing; 49 Colonial soldiers killed, 41 wounded 5 are missing. Thank you for your excellent and very detailed comment, complete with sources. I appreciate it and will fix the post and direct readers to your comment for more information.